If you're planning for retirement, you'll need to consider your eligibility for the Age Pension. As this article explains, it's not straight forward. I have been somewhat fascinated by recent changes to the Age Pension, so I wanted to share some interesting insights with you. Most retirees will be aware that once you reach a certain threshold in either income or assets, your age pension entitlement starts to decrease, and will cut out completely once you reach a cut out threshold. Most will agree this is fair and reasonable, given that those you have more assets or income do not need as much support via the age pension. However, there are some subtleties that are worth being aware of, and may enable you to optimise your total income in retirement. Let consider, for simplicity, you’re a member of a home owning couple. You’ve just turned 65.5 (current Age Pension age) and all your assets other than your home are financial assets, such as superannuation, savings, term deposits, shares etc (these are assessed by Centrelink under both the asset and income test using deeming rates). You have fully retired and have no other source of income. Let’s also assume that your financial assets are giving you income of 5% of the balance. This is quite typical, as it is common for retirees to convert their superannuation balance to an income stream and 5% is the minimum required pension from a superannuation income stream at the age of 65. 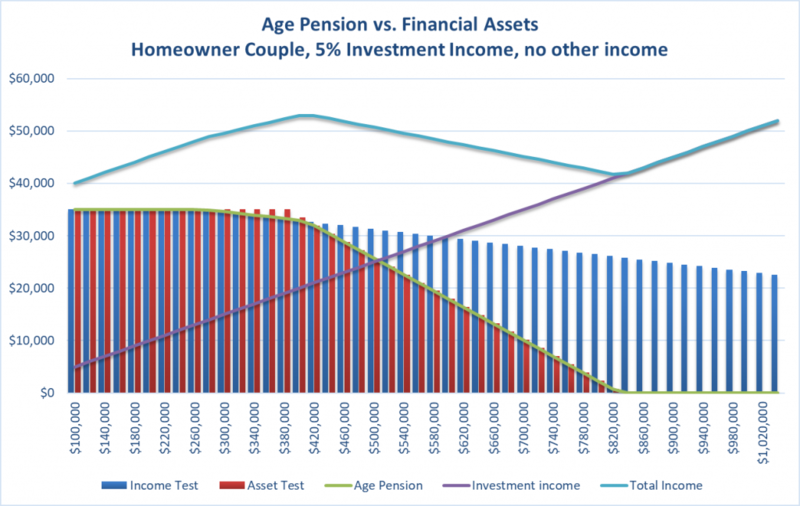 Now, I’ve plotted your age pension entitlement against financial assets in the graph below. Added to that is the 5% investment income (purple line) which give you the all important total income, represented by the blue line along the top. The first most striking observation is that the blue line peaks around $400,000 in financial assets, giving you a combined total income $52,980 per year. Beyond this point, the Asset test really starts to bite, reducing total income as a result of the rapidly reducing age pension. Total income does not recover to the same point until you have well over $1m in financial assets. This means that if you hold financial assets in excess of $400,000, but less than $1,060,000, you will receive less total income, assuming the constant 5% investment income, than someone who only has $400,000. Is that fair? Well, the answer probably depends on where you sit on the graph. This is no doubt the government’s way of forcing you to dig into your own pockets a bit more if you do have significant assets. After all, the purpose of superannuation is to provide for your retirement so from the government’s point of view, it makes sense to make you spend it. However, if you’re slightly above the $400,000 mark and coming up to retirement, you could consider reducing your assets down to around $400,000 to optimise your age pension entitlements. Arguably the best way to do this is to spend the excess amount on renovating or extending your home, as your home remains exempt from the asset test and you would likely increase the value of your home. Alternatively, you could splash out on a lavish holiday to kick off your retirement. The other subtlety illustrated in this chart is that the income test starts to reduce your pension well before the lower Asset test threshold. The Asset test threshold for a home owning couple to receive a full age pension is currently set at $380,500. However, if these assets are all financial assets, as in the scenario above, these are deemed to earn income assessed under the Income test. Effectively, this means the full pension threshold is reduced to around $272,100 in financial assets. The good news is that the rate of decrease under income test is much smaller than that of the asset test. Effective planning can help you maximise your eligibility for the aged pension, but this should be done as early as possible. That’s why we encourage everyone who is either retired now or contemplating retirement in the next 10 years to contact us to discuss this further. We can show you how to organise your finances to enjoy the best retirement possible.